Reviews deserve five stars. They’re honest opinions on goods and services that help consumers make an informed decision about a product before investing their money on it. They help brands understand what they’re doing well and what aspects of their business they can improve on. Plus, they help improve your SEO and Google ranking, which is what we’re all looking for. You can find reviews in every deep, dark crevice of the Internet. Some people swear by Yelp. They’ll only try something new after reading what 12 other people think of it. You find reviews on Facebook, in the comments section of an Instagram post. But, what we’re most concerned with is Google Reviews. 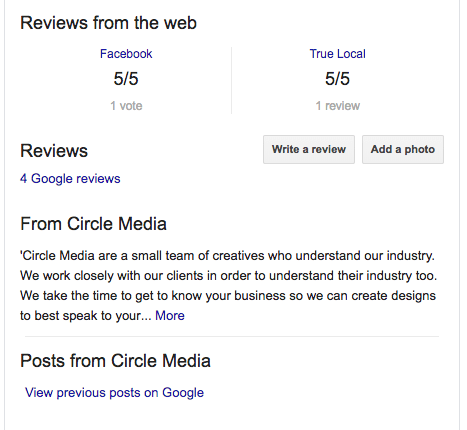 Google Reviews appear with your business details on the right of the search results. They’ll pop up if you’re looking for businesses on Google Maps and can be hugely influential. Google Reviews will help boost your SEO ranking so you’ll want to make sure you’re getting them. When people start the conversation about reviews, there’s generally hesitation. People are worried that they’ll get a few bad reviews and it’ll kill their business. But it won’t. The occasional negative review can actually be helpful, assuming you handle it correctly. Offering solutions to negative reviews, taking care of customer complaints and trying to fix the problem shows people you care about your customers and are invested in them getting the most out of your product or service. If you’re running a good business you’ll be getting far more positive interactions than negative, so it’s just about getting customers to post about their good ones. When you have a good experience with a product you don’t automatically go to leave a glowing review (but you should). So to start building up a collection of reviews, ask your loyal customers to drop you a review, then start thinking about how you’re going to encourage new customers to do the same. Companies often provide a link on their website, or at the end of their emails to send people straight to the review form, which makes it easy for customers to help you out. It’s important not to offer incentives or rewards in exchange for reviews. Google is really cracking down. Given how valuable reviews are for businesses, Google is paying close attention to who is posting them to ensure they are genuine. This means you aren’t allowed to review where you work, offer free goods in exchange for reviews or post negative reviews about a competitor. You’ll be at risk of having your account blocked and your reviews removed. Ultimately Google Reviews will help you seal the deal. If people have gone all the way to looking at your reviews, chances are they’re serious about buying your product. This makes it more important than ever to have good reviews to help seal the deal. Plus, they’re going to help your SEO rating. So help a friend out. 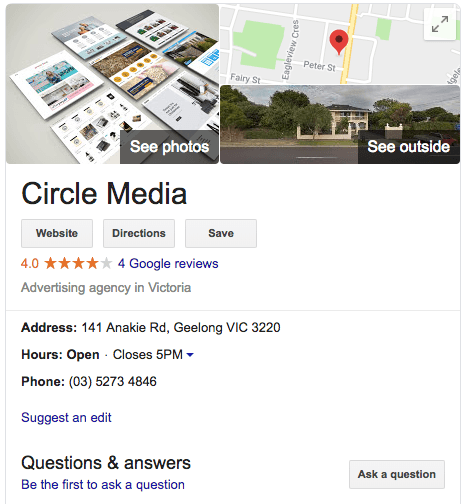 If you’ve got any questions about Google reviews or how to boost your SEO rating, talk to the team at Circle Media today. And leave a great Google Review for us while you’re at it!